Make some art that you can wear! Button Up Designs will show you how to create your own colourful resin jewellery- you’ll design and create two resin bangles and two resin rings to take home and show off. Learn how to mix resin, add colour pigment and finish your jewellery pieces. You’ll get a brief explanation of how to use resin to create your own one-of-a-kind jewellery pieces, plus demonstrations on how to work quickly and efficiently with pouring resin into various jewellery moulds. You’ll choose your colour pigments, moulds and embellishments, and create unique designs so your pieces will be uniquely you. You’ll sand and polish your pieces at the end of the sesh, ready to take home and wear- just waiting for the compliments to roll in! Jodie Banasik has been working with resin for the past six years under her label, ButtonUp Designs. 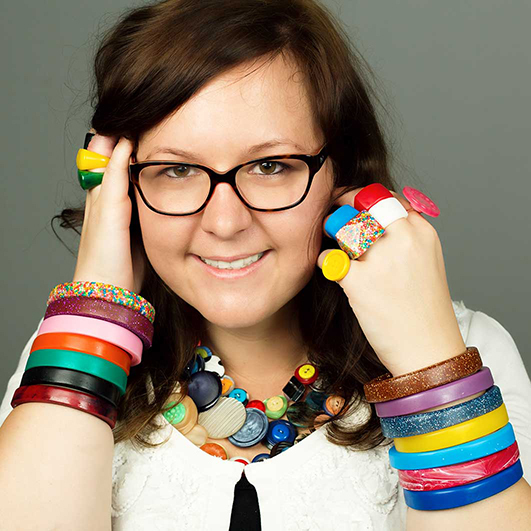 Creating designs including her signature statement resin button necklaces and an assortment of resin jewellery and homewares, Jodie’s passion for resin is shown through her love for colour, chaos and creativity in her classes. Each and every design is carefully planned out and hand crafted in her Sydney home studio with love and care. Jodie draws upon inspiration from patterns and colours found in bold objects and bright elements of designs from the 1990’s. Combining a love of teaching and sharing the creative spirit, Jodie began teaching resin classes three years ago and has taught at local community colleges, art centres and festivals including the Sydney Fringe. Resin is easy to work with and a great skill to learn for anyone wanting to create their own personally designed jewellery.